Malaria in pregnancy (MIP) accounts for 25% of all maternal deaths in Angola, a country with one of the highest rates of maternal mortality in the world. 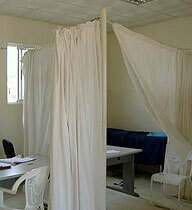 And although MIP prevention and control interventions are simple and relatively inexpensive, they are not reaching those who need them: only 25% of pregnant women in Angola sleep under insecticide-treated bed nets (ITNs) and only 3% of pregnant women take the recommended two doses of intermittent preventative treatment in pregnancy (IPTp). A 2006 assessment of MIP programs in Angola revealed that the country’s MIP control services were poor, even nonexistent in some areas. The assessment also identified that the country lacked effective data recording and reporting systems to monitor and evaluate its MIP services. The findings indicated that Angola’s health providers needed the knowledge, tools and encouragement to improve services and achieve MIP control targets. In collaboration with the Angolan Ministry of Health, the ExxonMobil Foundation and Esso-Angola (an ExxonMobil subsidiary), Jhpiego is developing MIP data management systems that better inform the decisions of service providers, managers and policymakers—with the goal of using data management to expand and improve MIP services. To date, Jhpiego has assisted nine health centers across three municipalities in Luanda Province with the implementation of the developed data management systems, with plans to scale up the program to 10 additional health facilities in Benguela and Bié Provinces. Training activities conducted by program partners have empowered antenatal care nurses and their supervisors to use data management systems to make more informed decisions about MIP prevention, care and treatment. 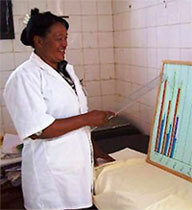 The antenatal care nurses also evaluate their own work against 18 quality performance standards. At the facility level, Jhpiego trained antenatal care nurses to draw graphs to track MIP service statistics on a monthly basis. Data presented in this way assist antenatal care nurses identify gaps and brainstorm solutions—ultimately improving the quality of MIP services as a result of their analyses. Jhpiego’s program in Angola is improving services; the director of the Alegria Health Center’s Antenatal Care Clinic is one of the health staff who used her new skills to make changes. She said, “Things are much better organized since this project started … so we can meet each client without rushing.” Likewise the Head of the ANC Clinic at Kassaquel Health Center was happy to share that, “When I see that IPTp2 is down from one month to the next [on the graph], it is a red flag that something is wrong. We need to do something to find the solution.” These health workers demonstrate that better counting of their malaria services will enable Angola to count malaria out.